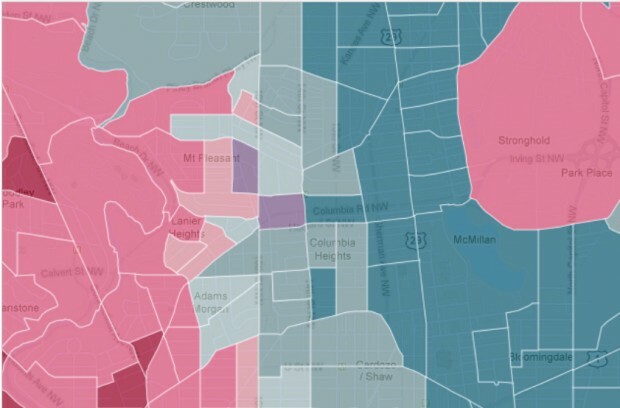 There’s nothing like a color coded map to help you understand D.C.’s demographic changes. The Washington Post‘s interactive Census map details the density of racial groups by blocks throughout D.C.-metro area. After zooming in on the District, it appears some of the most dramatic changes over the past 30 years occurred in Shaw, Columbia Heights and Petworth. The blocks just north of the U Street corridor used to be 77 percent black and 5 percent white; now, they’re 15 percent black and 66 percent white. Columbia Heights blocks that once had a black majorities are now mostly Hispanic. 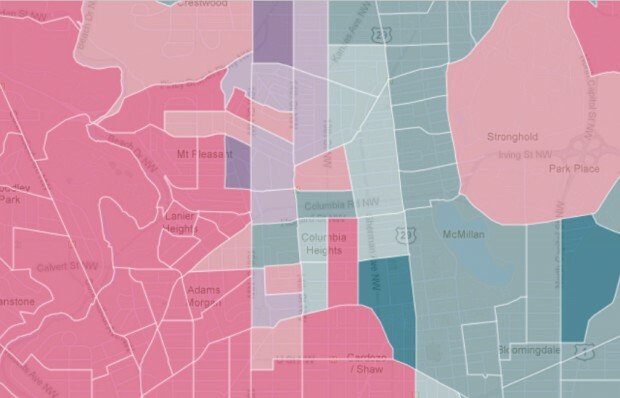 Blocks between Georgia and Sherman avenues were majority black in 1990 and still are — although to a much lesser degree. It’s also worth noting that some of these blocks have more people than 30 years ago. For instance, those blocks north of U Street have about 1,000 more people overall. Thanks @IMGoph for pointing that out.